The launch of Apple's iPad mini appears to have slowed the rate at which competitors have been able to eat into the company's overwhelming lead in the tablet sector, according to a new study out Thursday, even as Amazon and Samsung tablets continue to carve out their own share. The new figures from Chitika Insights illustrate tablet use for the North American market, based on an analysis of web traffic between Feb. 15 and Feb. 21. Chitika's report found that Apple's iPad devices held 80.5 percent of traffic share among all tablets, down slightly from last month's share of 81 percent. The rate of decline in the iPad's share, though, dropped sharply from January to February. A Chitika report in January saw the iPad's web traffic share dipping by about six percent over the holiday period before recovering slightly. Speaking with Apple Insider, a Chitika spokesperson attributed the lower rate of decline at least in part to the popularity of the iPad mini. No competing devices achieved double digit traffic share. Amazon's Kindle Fire line came in a distant second at eight percent traffic share, while Samsung's Galaxy line of tablets inched up to 4.2 percent. Share for Google's Nexus tablets declined 0.06 percent over the period. A generic "Other Android Tablets" category gained 0.39 percent. The Chitika representative assured Apple Insider that, even though the share fluctuations are small, the firm compensates for possible sampling errors. "Our network is very extensive," the representative explained, "with more than 250,000 websites. The sample that we take, the tens of millions of impressions, come from across industries: sports, automotive, and so on. If we see a change across our entire network, then we feel that that accounts for the possibility of sampling error. If we see it in just one area, then we take a closer look at that." 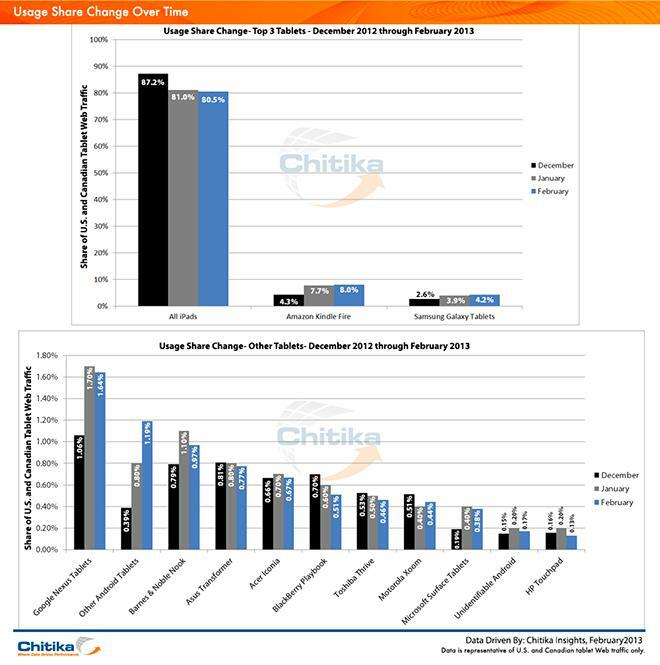 Chitika's web traffic figures are a far cry from industry research figures on tablet shipments, but that disparity, the Chitika spokesperson said, likely reflects the different usage patterns for different devices. "We don't break this up by specific IP addresses. When you look at tablet share sales from analysts, and you see the iPad at 50 percent of the market, that does likely mean that iPad users are browsing more frequently with their devices than are other tablet owners." The past several months have shown a slight but gradual downward trend in share for Apple's best-selling tablet. Asked whether one could extrapolate on the trend, which would see the iPad dropping to 75 percent share possibly over the summer, the representative noted that unforeseen product announcements have a way of interrupting trends. Rumors of a forthcoming iPad refresh could, then, cause a big spike in Apple's share of web traffic, and perhaps doubly so, given the indications that iPad users browse the web more often with their devices.